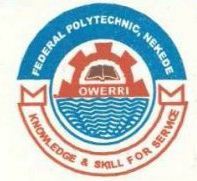 Federal Polytechnic Nekede, Owerri (FPNO) Resumption Date from Election Break for Continuation of Academic Activities for 2018/2019 Academic Activities. This is to inform the staff and students of the Federal Polytechnic Nekede, Owerri (FPNO), that the Gubernatorial election which was postponed affected the sequel election break resumption date which was slated for 3rd March, 2019. Consequently, the election break ends on Sunday 10th March and lectures begins on Monday 11th March, 2019. Students are advised to resume lectures without hesitation.